Occurrence: Apricot is consumed as fresh and processed fruit, juices, jams, jellies, preserves. Like many other allergies to fresh fruits and vegetables, apricot allergy can take two different forms. In the North of Europe, a milder form of apricot allergy is associated to birch-pollen allergy due to the similarity between a protein in birch that causes birch-pollen allergy, and an apricot protein. This is called the birch-fruit syndrome with symptoms confined largely to the mouth, causing a condition called “oral allergy syndrome” (OAS). The molecule, known as an allergen, involved in this kind of allergy does not survive cooking. 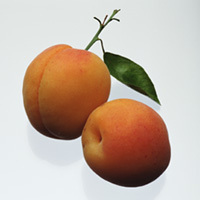 Therefore, people who react to this allergen can tolerate cooked apricot. Individuals with apricot allergy might develop adverse reactions to other fruits including apple, pear, cherry, nuts such as hazelnut, or vegetables such as celeriac (celery tuber) and carrot. In Mediterranean countries, people with apricot allergy do not have birch-pollen allergy. Instead they often have allergy to peach. These individuals develop adverse reactions to apricot because of the similarity between the allergens in peach and apricot. Symptoms are more severe including generalised urticaria, abdominal pain, vomiting and life-threatening symptoms, sometimes in addition to the OAS. The allergen that causes this kind of allergy is tough and the allergenicity survives in processed foods such as juices and jams. As a result, individuals with this kind of allergy cannot eat even cooked fruits. Individuals with apricot allergy also tend to develop adverse reactions to other fruits including peach, apple, cherry, plum, and nuts (such as hazelnut and walnut). Pastorello et al. (1994)  and Pastorello et al. (2000)  used histamine dihydrochloride (10 mg/mL) as a positive control, and the glycerol-containing diluent of the prick solution as a negative control. A wheal graded at least 2+was regarded as positive. All patients of Pastorello et al. (1994)  and Pastorello et al. (2000)  showed a positive SPT. 87.5% of sera (14 of 16) of Pastorello et al. 1994 , showed Ig E binding to a 13 kDa protein and 77% (14 of 18) to a 30 kDa protein . The other IgE -binding components were: 70 kDa (6 of 16, 37.5%), 20 kDa (5 of 16, 31%), 14 kDa (4 of 16, 25%), 40 kDa (4 of 16, 25%) and 30 kDa (2 of 16, 12.5%). Only the component at 13 kDa was detectable in patients with negative responses to birch pollen. Clinically relevant cross-reactivity between apricot and peach has been observed by immunoblot inhibition (Pastorello et al. 1994) . Evidence for a lipid transfer protein as the major allergen of apricot. Nature of main cross-reacting proteins:As a consequence of the homologies found between PR10 proteins in birch (Bet v 1), apple (Mal d 1), apricot (Pru ar 1), hazelnut (Cor a 1) and other vegetable sources, Vieths et al. (2002)  suggested that Pru ar 1 is involved in IgE cross-reactive allergies. In most cases Bet v 1 seems to be the sensitizing agent. Allergen properties & biological function:This allergen is likely to be a pathogenesis-related protein and may have a role in plant protection against insect pests and microbial pathogens. However its precise function is not known. Sequence of an Allergen-, Stress-, and Pathogenesis-related Protein From Apricot Fruit (Accession No. U93165). Gene Expression During Fruit Ripening. (PGR97-180). Allergen properties & biological function:Pru ar 3 has been identified as a nonspecific lipid transfer protein (ns LTP). Plant ns LTPs are thought to be involved in transport of fatty acids both intracellular and extracellularly and of cutin monomers to the cuticular layer of leaves and fruits. There is an expandable cavity between the four alpha-helices which can bind one or two lipids. nsLTPs have also been reported to act as plant defense proteins against bacterial and fungal infections and form the PR14 family of pathogenesis related proteins. (Lindorff-Larsen et al. 2001 ). Allergen purification:Pru ar 3 was purified by cation-exchange chromatography using a Resource-S column. The gradient length was 20 column volumes, with a flow rate of 6 mL/min. Gel filtration Superdex 75 column equilibrated and eluted with 50 mmol/L sodium acetate 3-hydrate at a flow rate of 0.7 mL/min was used (Pastorello et al. 2000) .